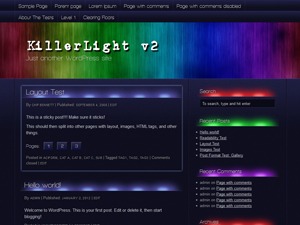 My first WordPress theme, KillerLight, has been released on wordpress.org. 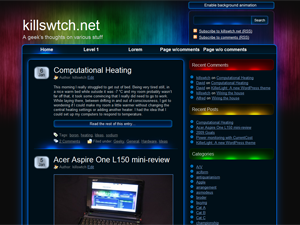 The theme is a slightly altered version of the one used on here. One important thing to note about the theme is that IE 6 is not supported – it’s just not worth the effort. Instead, a message is displayed to users of IE < 7 informing them that they should either upgrade or get a different browser.